WordPress, 10 ans déjà ! 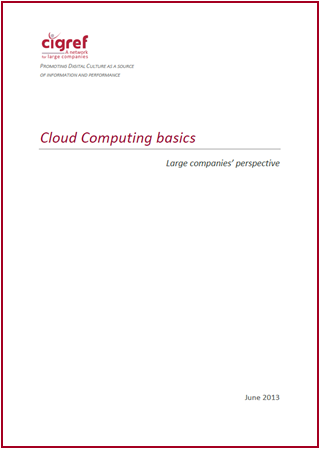 CIGREF today published the “Cloud Computing basics: Large companies’ perspective” report. CIGREF’s previous works had highlighted several disagreements in the understanding of SaaS and Cloud Computing. The main one was a lack of a clear definition of these concepts. CIGREF’s working group therefore focused on Cloud Computing basics. It revised and redefined them according to the way they were understood and used in companies and not according to offers from the IT ecosystem market. Ce document est la version anglaise du rapport “Les fondamentaux du Cloud computing” paru en mars 2013.